Albania within its present-day borders. 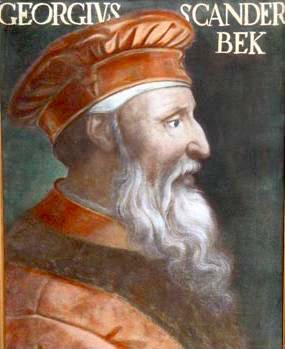 Pashalik of Scutari (1757-1831) was the last of the Albanian pashaliks to fall. Albanians be united in a single autonomous Ottoman province. League of Prizren organized armed resistance efforts in Gusinje, Plav, Scutari, Prizren, Preveza, and Ioannina. A border tribesman at the time described the frontier as "floating on blood." Albanian National Awakening and by early 20th-century Albanian rebels. Albanians had no common geographical or political nerve center. The Albanians' religious differences forced nationalist leaders to give the national movement a purely secular character that alienated religious leaders. The most significant factor uniting the Albanians, their spoken language, lacked a standard literary form and even a standard alphabet. Each of the three available choices, the Latin, Cyrillic, and Arabic scripts, implied different political and religious orientations opposed by one or another element of the population. In 1878 there were no Albanian-language schools in the most developed of the Albanian-inhabited areas and the choice for education was between Orthodox Church schools, where education was in Greek and Ottoman government schools where education was in Turkish. 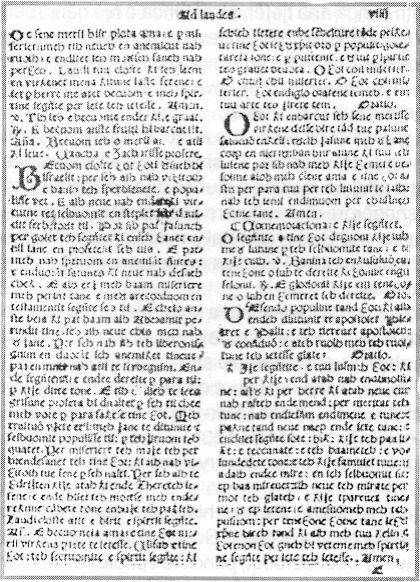 Albanezul, the newspaper of the Albanian minority in Romania from 1889. Naum Veqilharxhi's Vithkuqi script was the first Albanian alphabet published in 1845. 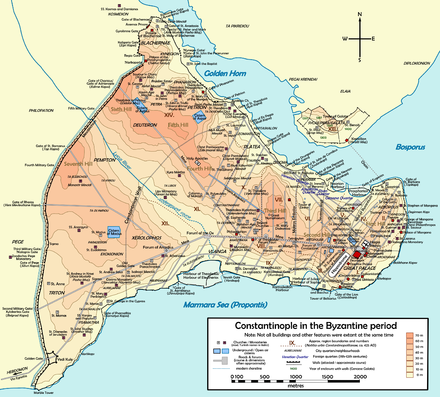 Constantinople in 1879, Sami Frashëri founded a cultural and educational organization, the Society for the Printing of Albanian Writings, whose membership comprised Muslim, Catholic, and Orthodox Albanians. Naim Frashëri, the most-renowned Albanian poet, joined the society and wrote and edited textbooks. Albanian émigrés in Bulgaria, Egypt, Italy, Romania, and the United States supported the society's work. 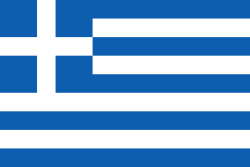 The Greeks, who dominated the education of Orthodox Albanians, joined the Turks in suppressing the Albanians' culture, especially Albanian-language education. In 1886 the ecumenical patriarch of Constantinople threatened to excommunicate anyone found reading or writing Albanian, and priests taught that God would not understand prayers uttered in Albanian. In 1844-5 however, Albanian intellectual Naum Veqilharxhi published his work Evëtori Shqip Fort i Shkurtër (English: The short Albanian Evëtor) which was an alphabet that included thirty three letters which were invented by himself. 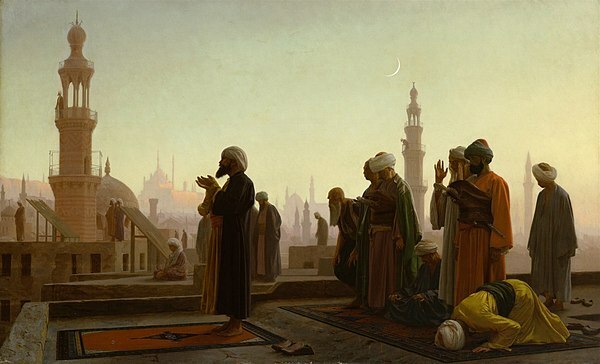 He avoided the use of Latin, Greek or Arabic alphabets and characters because of their religious associations and divisions. In November 1869, a Commission for the Alphabet of the Albanian Language was gathered in Istanbul. The Commission of the Manastir Congress in a rare photo (1908). Albanian language was opened on the initiative of individual teachers and other intellectuals on 7 March 1887 in Korce. Diamanti Tërpo, a citizen of the city, offered her house to serve as a school building. The first director and teacher of the school was Pandeli Sotiri. Montenegro an assembly of the tribal leaders of the revolt was held to adopt the "Greçë Memorandum". This memorandum was signed by 22 Albanian chieftains, four from each tribe of Hoti, Grudë and Skrel, five from Kastrati, three from Klemendi and two from Shalë. Skopje after being captured by Albanian revolutionaries in August, 1912 who defeated the Ottoman forces holding the city. Vlorë photographed in November 1912. In Vlora, on the 15th/28th of November. That time the President was Ismail Kemal Bey, in which he spoke of the great perils facing Albania today, the delegates have all decided unanimously that Albania, as of today, should be on her own, free and independent. War in its concluding Treaty of London of May 1913. The Albanian delegation in London was assisted by Aubrey Herbert, MP, a passionate advocate of their cause. Vlorë on 28 November 1913. The recognized borders of Albania. Library of Congress Country Study of Albania Elsie, Robert (2010). 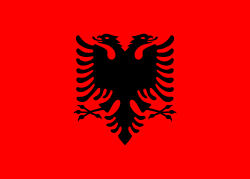 Historical Dictionary of Albania. Lanham, Maryland: Scarecrow Press (The Rowman & Littlefield Publishing Group Incorporated). ISBN 0-8108-6188-7. Mazower, Mark (2000). The Balkans: A Short History. Modern Library Chronicles. New York: Random House. ISBN 0-679-64087-8. Schwandner-Sievers and Fischer (eds. ), Albanian Identities: Myth and History, Indiana University Press (2002), ISBN 0-253-21570-6. Skendi, Stavro (1967). 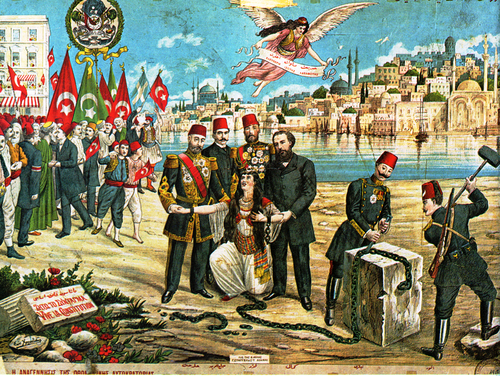 The Albanian national awakening, 1878–1912. Princeton University Press.